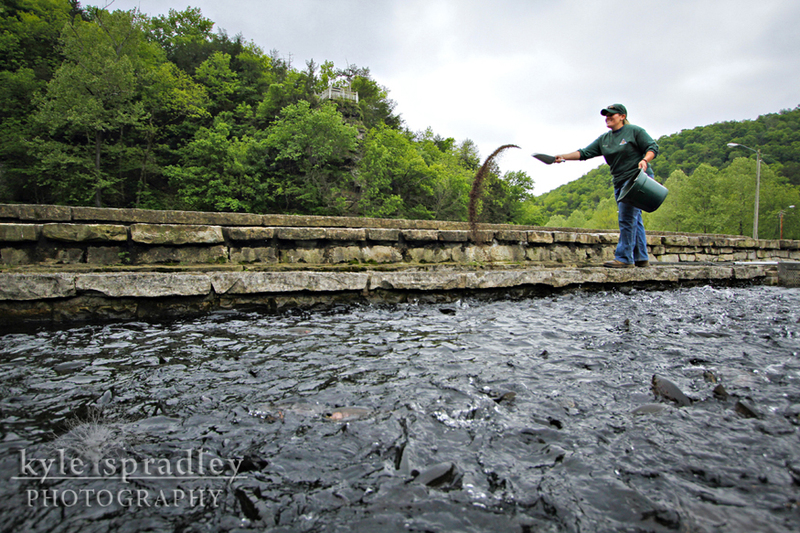 Finally finished my story on Roaring River State Park for our June issue of Rural Missouri magazine. Here are some of my images from Opening Day on March 1 and from a few days down in the park. Be posting the video piece soon, once it finishes uploading. 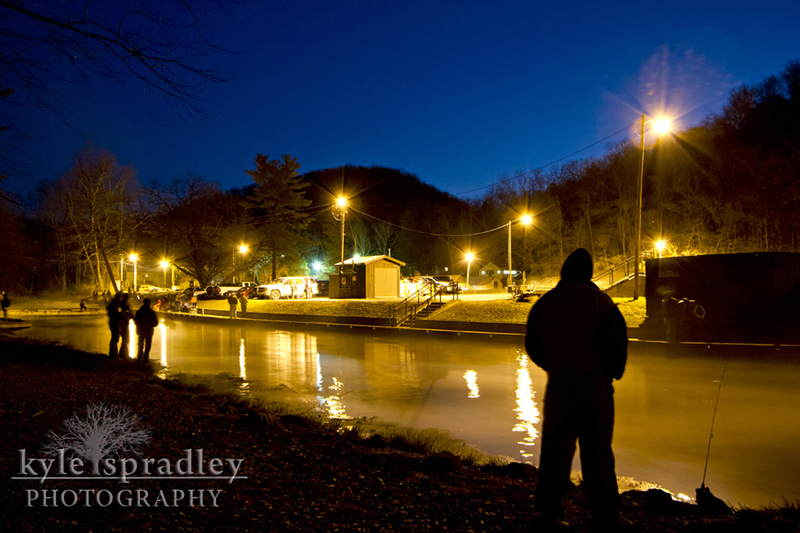 Anglers wait on the banks of Roaring River before the start of Opening Day on March 1 at Roaring River State Park near Cassville, Mo. 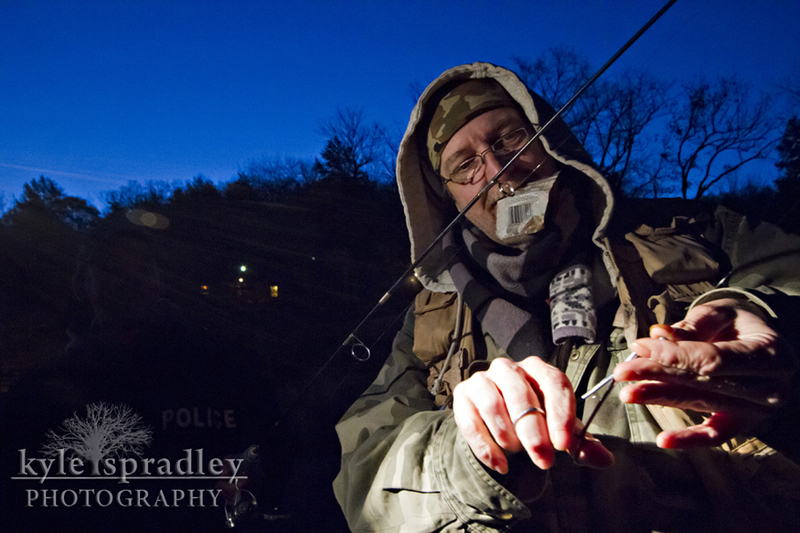 An angler ties a lure on his line before the horn sounds on opening day. 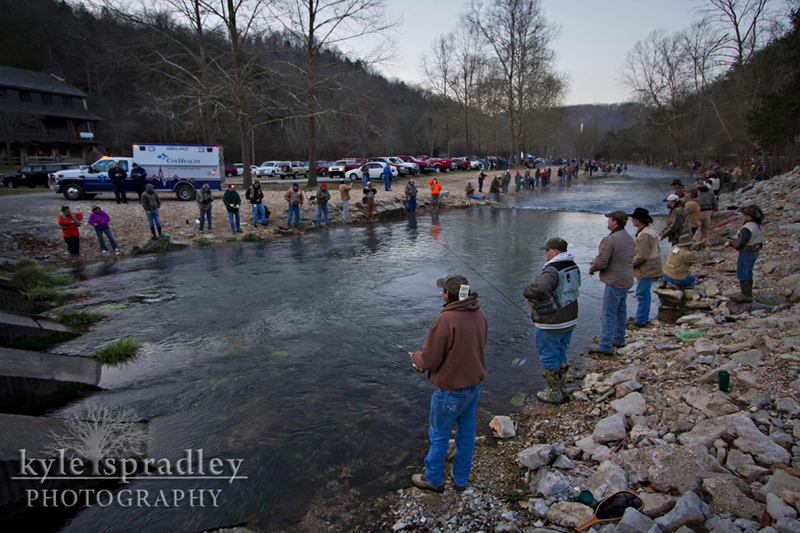 Anglers cast into Roaring River at the start of Opening Day. 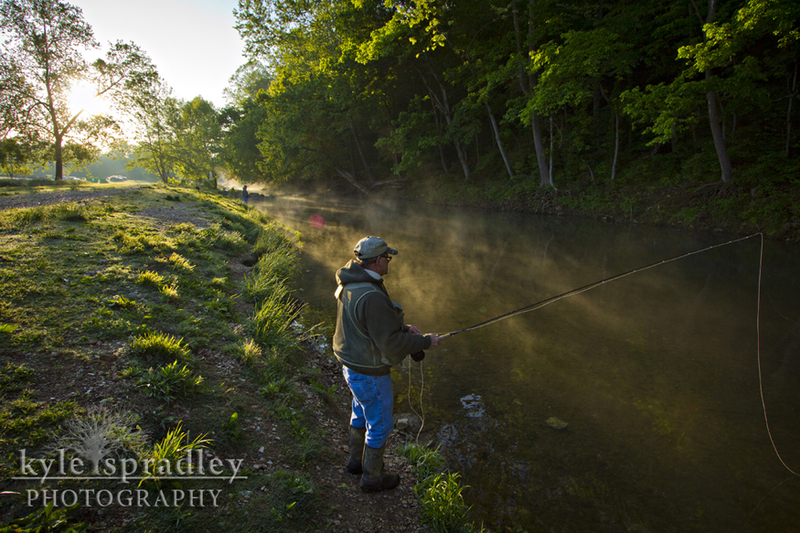 Opening Day is a different type of fishing, where anglers often fish elbow to elbow in hopes of landing lunker trout. 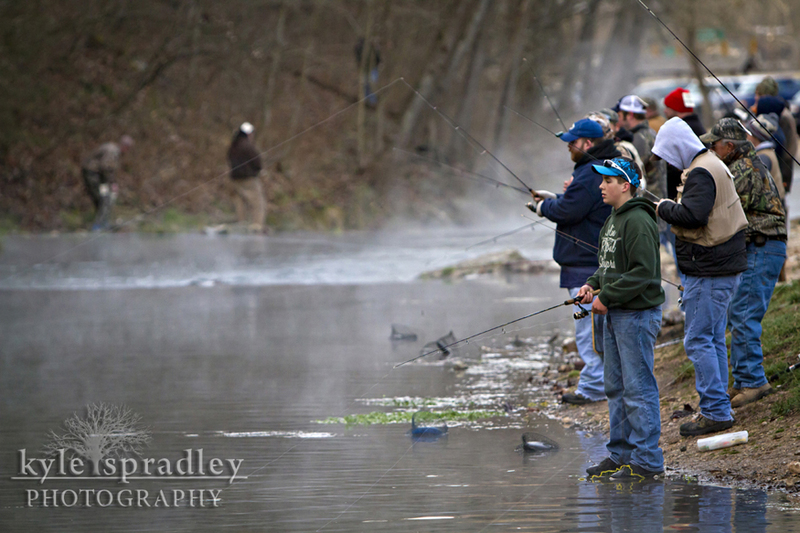 Fishing on Opening Day at Roaring River State Park is a revered tradition for many Missourians. 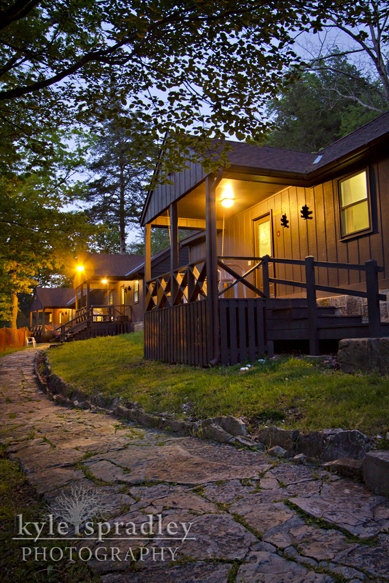 The park has 26 cabins available for overnight guests. 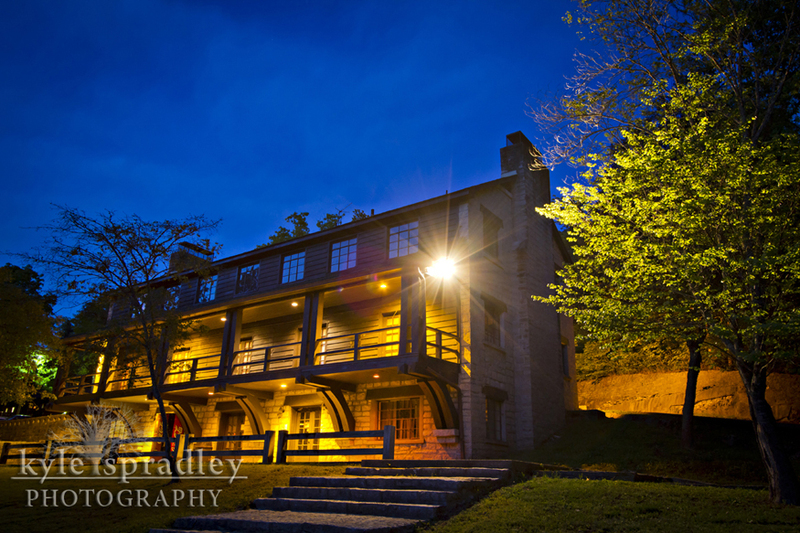 The CCC lodge is one of many historical buildings in the park that date back to when the Civilian Conservation Corps worked inside the park. In the 1930s, the "CCC boys" constructed several structures, trails and the present-day fish hatchery. 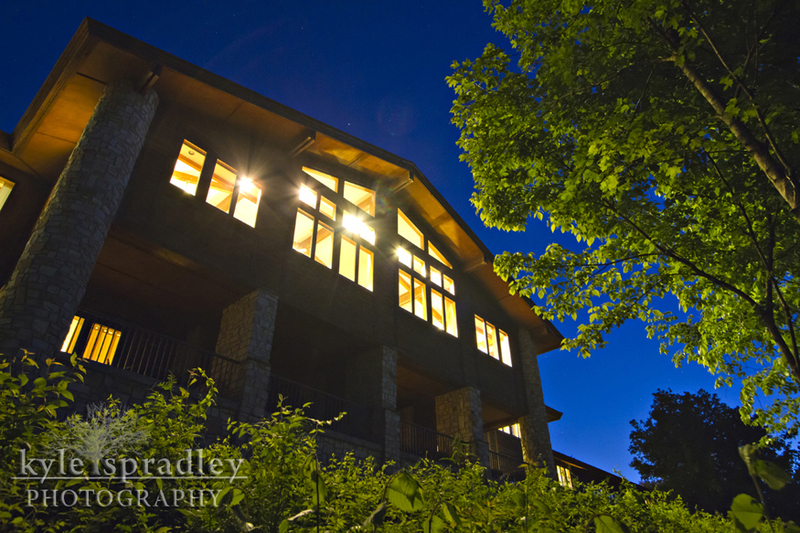 The Emory Melton Inn and Conference Center is known for its rustic look and relaxing hotel rooms. A fly-fisherman casts into Roaring River near Campground 3. Different zones of the park along the river are marked for different styles of fishing to accompany waders, fly-fishermen and a wide variety of lure choices. 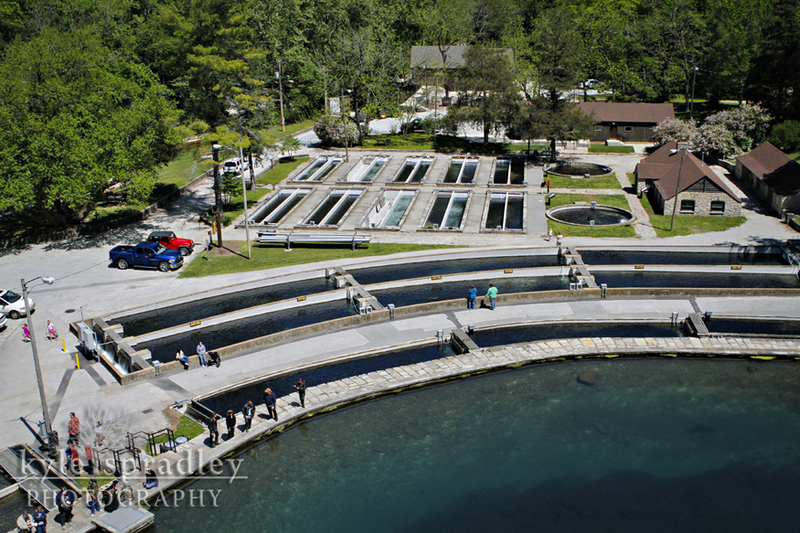 A view of the fish hatchery from the Doe Run Trail overlook. 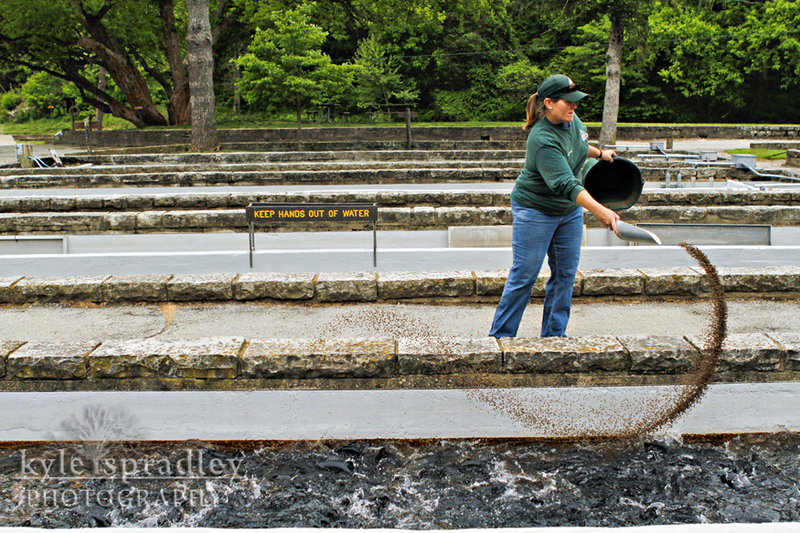 The hatchery and river is feed by Roaring River Spring, Missouri's 20th largest spring, that pumps out more than 20 million gallons of water a day. 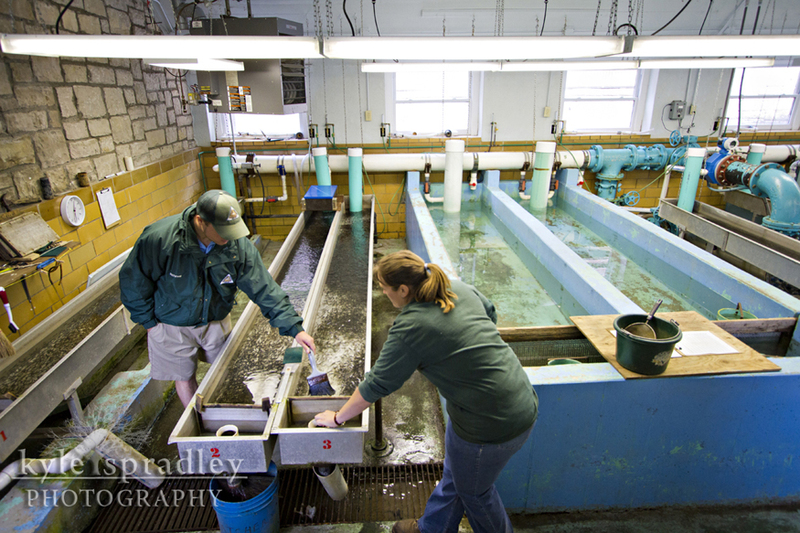 Inside one of the hatchery buildings where MDC biologists raise the trout from spawning eggs. 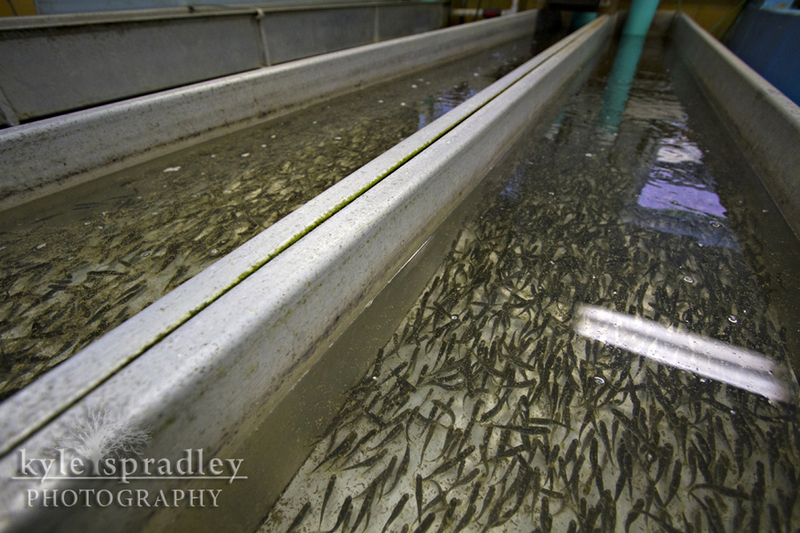 Once the fish reach 3 inches, they are brought to the outdoor hatchery pools. 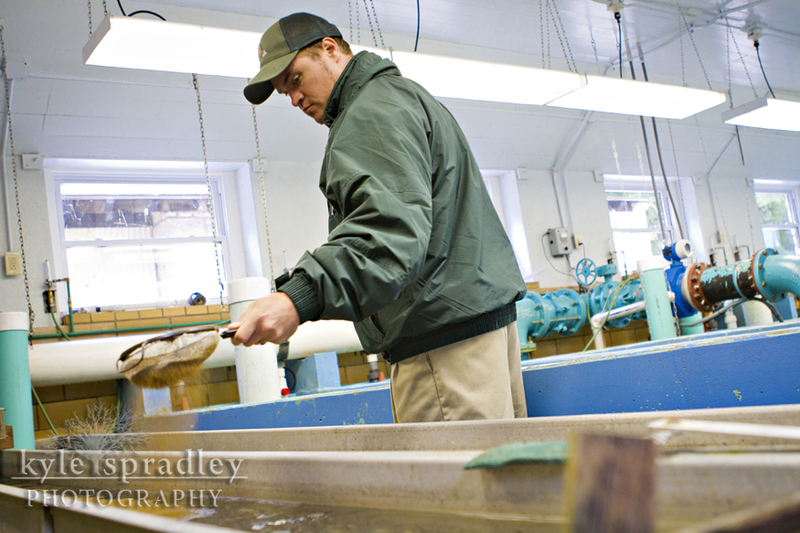 MDC biologist Brad Follmer feeds juvenile trout inside one of the hatchery's buildings. 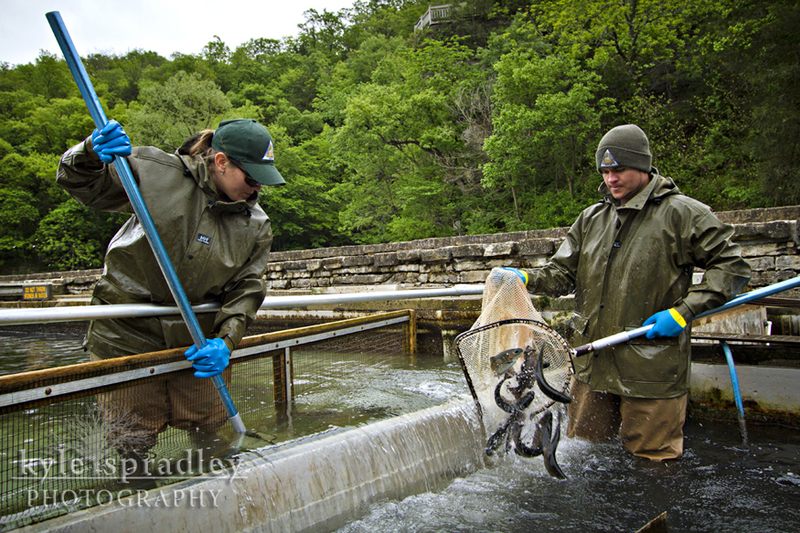 MDC biologists Julie Fraley and Brad Farwell move trout from one raceway to the next — their last stop before released into the river. 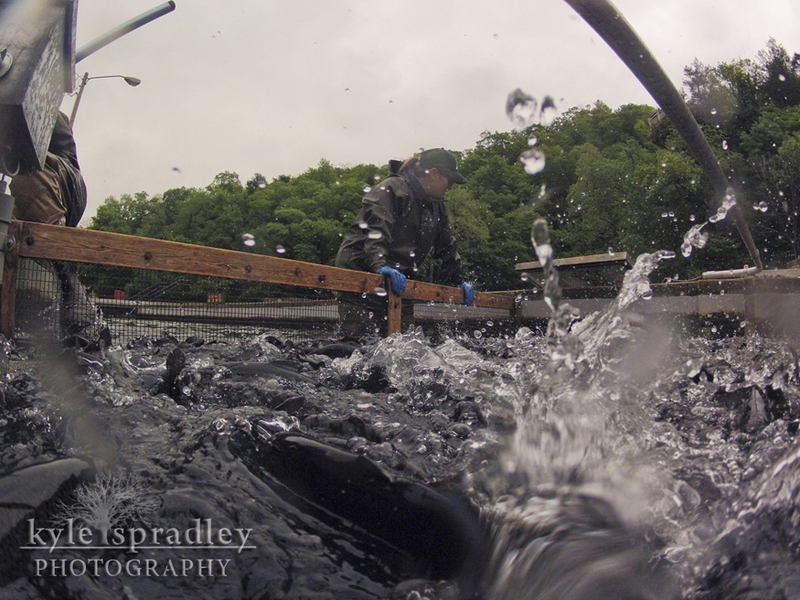 Julie Fraley wrangles up trout to allow easier transportation to a new raceway. 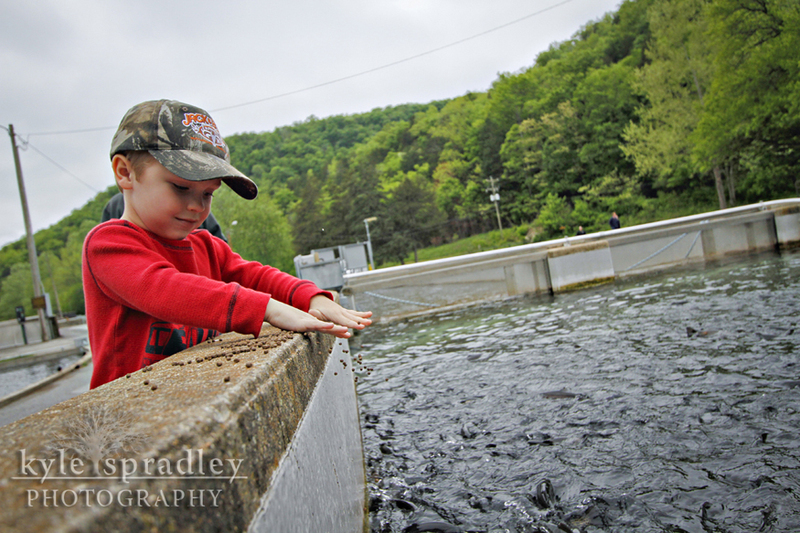 A youngster feeds the trout. 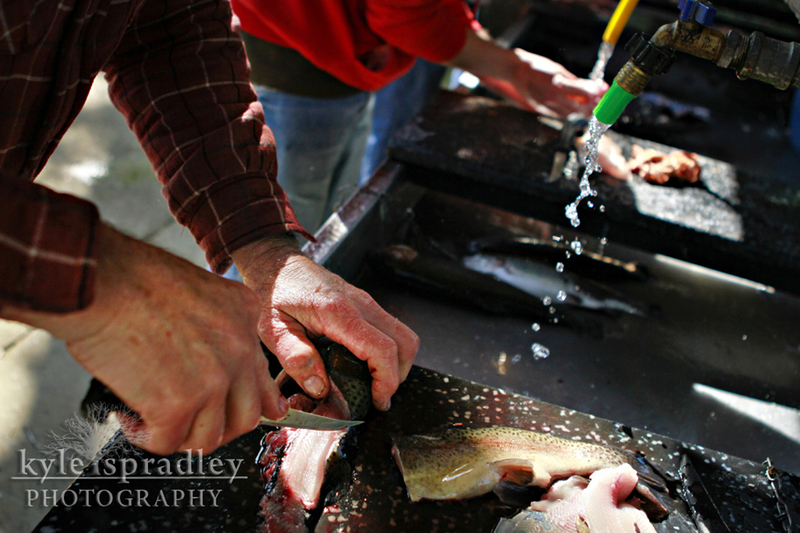 Anglers filet up trout for later meals. Been working on a story for our next month's issue of Rural Missouri on Roaring River State Park near Cassville, in southwest Missouri. This is a truly amazing state park known for its trout fishing. There is great history at this park from the days of the Civilian Conservation Corps to the fish hatchery to opening day of trout season. If you are ever in the area, stop by. 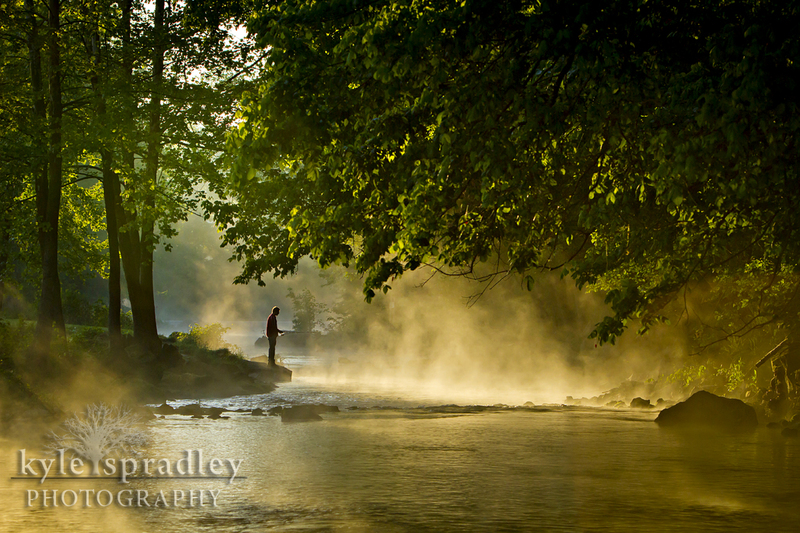 Got this shot of a fisherman in the early morning fog near Campground 3. Stay tuned for more images, a video piece and the story.